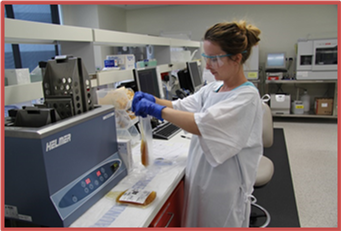 When a request for FFP is received at the laboratory, staff first review existing thawed FFP and ELP stock. 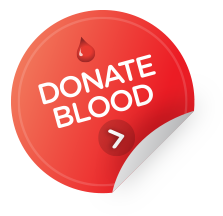 FFP is only thawed if there is no suitable thawed plasma available. The date and time of thawing is documented on the swing tag attached to the bag. If the thawed product is not used and remains under controlled storage conditions at 2 - 6°C, the product is “converted” to ELP. At this point, an additional luggage label is attached to the plasma that identifies it as ELP. Two units of group AB FFP are kept thawed as ELP at all times for emergency use. A sign on the front of the fridge is updated daily and allows staff to quickly see available ELP and date of expiry. The AB ELP is reserved for trauma patients for 3 days, after which time it can be re-directed for any patient requiring FFP for a further 2 days. This practice ensures group AB plasma is readily available for trauma patients whilst reducing unnecessary wastage. The laboratory maintains a log of all ELP and its fate, either used or discarded. 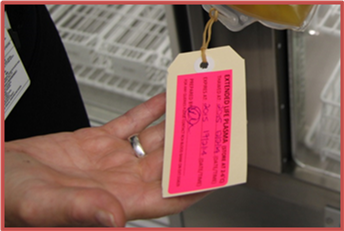 The ELP and its expiry date and time are easily identified by pink swing tags, which were selected as they stand out well against the laboratories normal swing tags. As FFP is thawed, the time is recorded so that if, or when, the FFP is converted to ELP, the time of expiry can be correctly noted on the new tag.